Integrated Pest Management – What it is and what it isn’t. Integrated Pest Management – What it is. Integrated Pest Management – What it is Not. IPM is seldom a single solution to a long term problem. The solutions integrate a series of practices and tools to provide long term solutions. It is important to seek advice from qualified consultants, university and extension staff. Many resources are free of charge. Cannabis can be a complex crop, therefore the solutions to pests or diseases sometimes incorporate approaching the problem from different perspectives. A CCP is a specific point, procedure, or step in cannabis production at which control can be exercised to reduce, eliminate, or prevent the possibility of a pest or disease. All incoming plants should be inspected by for pests and diseases as soon as the plants have arrived at the facility. The grower should also implement a plan that includes beneficial insects and biological pesticides to reduce the likelihood of pest or disease infestation. Some growers designate a “holding area” for incoming plants. The function of a holding area is to quarantine pests or diseases. When the plants are determined to be healthy, then they can become part of production. When the plant material is received at the facility they should be carefully inspected using magnification to detect pests or diseases. After inspection, dip cuttings in an approved insecticide such as horticultural oil. Suffoil-X is OMRI listed mineral oil used to dip cuttings before planting. For more information, refer to the link below. A policy should be developed for all new employees to be trained about the prevention of pests and diseases. All employees should start each work day with clean clothes. A pair of work shoes should be kept at the facility to prevent the movement of pests from the outdoors. If you discover an infestation in the facility, quarantine the area. Do not allow workers to touch infested material and move to a room that’s free of pests or disease. When you plan work for the day, consider keeping the employee working for the entire day in a pest free area. If someone visits an infestation, make sure it is the last place they visit before the end of the work day. During the production cycle, all leaf matter that has fallen to the ground or trimmed off the plants should be disposed of in an approved manner. Benches, tables, trimmers and empty rooms should be cleaned with an approved disinfectant. The OMRI listed products Zerotol and Sanidate are the standard for killing pathogens in production facilities. All information is on the BioSafe website. Spider mites are the cannabis grower’s main pest. Spider Mites pierce the leaf tissue to get at the chlorophyll. The first thing you need to know about them is that they like a dry environment. Stratiolaelaps scimitus (Hypoaspis miles) goes after Spider Mites in the soil. Release Stratiolaelaps scimitus to the soil right after planting. Reintroduce again if you notice that, despite your best efforts, Spider Mites have arrived anyway. Release Stratiolaelaps scimitus in the soil. You can also release this beneficial insect to the ground and in nooks and crannies of aroom. Amblyseius fallacis is a good preventer of Spider Mites. Amblyseius fallacis is to be used only when you don’t have a serious problem with Spider Mites. It will hang around, spreading itself evenly throughout the greenhouse. If you’ve had Spider Mites before, then establish Amblyseius fallacis at the beginning, before planting. 2 mites per square foot should do the trick. This Spider Mite predator can be used with Amblyseius fallacis. They won’t get in each other’s way. Phytoseiulus persimilis likes Spider Mite webs, while Amblyseius fallacis doesn’t. Because Phytoseiulus persimilis like webs, it’s an ideal enemy of adult Spider Mites. If there’s an outbreak of Spider Mites and webbing occurs, then Phytoseiulus persimilis is your friend. Mesosiulus longipes is another good Spider Mite predator, which may be better suited to your grow environment if it’s fairly dry to begin with. They handle lower humidity, which is what Spider Mites like. But Mesosiulus longipes needs more humidity as the temperature rises. So keep your greenhouse warm, use artificial light and apply 3 Mesosiulus longipes per square foot for a week and then again the next week. That should be enough. Californicus is a useful predator of many mites. It’s particularly useful for the control of Spider Mites, which like dry environments. But so does Californicus, and it can cope with different temperatures. Although, if it has to choose, it, like most Californians, will choose warm or hot weather. If you’ve seen a few Spider Mites and are expecting more, then get your Californicus out there right away. They like a generous population on which to feed, and, Spider Mites taken care of, are likely to hang around and eat pollen until more Spider Mites show up. This helpful predator will deal with many mites. It’s got a specific taste for Broad Mites, Hemp Russet Mites and Spider Mites. Release Amblyseius andersoni early, when Spider Mites are just showing their presence; that’s when Amblyseius andersoni is most helpful. You’ll get your Amblyseius andersoni in either a shaker bottle or sachet. The bottle makes it easy to carefully release Amblyseius andersoni onto the plants, close to the flowers. You’ll want to let out 2 or 3 Amblyseius andersoni for every 10 square feet of greenhouse. Keep sachets out of direct sunlight and use 1 every 2 meters along a crop row. release on the plant, on whichever leaf or twig suggests itself. A sachet should work for up to 6 weeks, but can last a bit longer if Amblyseius andersoni become properly established. Galendromus occidentalis, another native Californian mite, can be useful to the grower who’s noticed Spider Mites becoming a bigger problem. Galendromus occidentalis doesn’t feed on eggs, but likes nymph and adult Spider Mites. 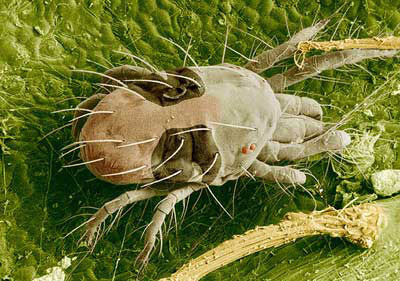 It also likes other mites, including Hemp Russet Mites. It can handle environments of 40% humidity and below. Release Galendromus occidentalis when you see the Spider Mites. 2 or 3 per square foot should do it. Do this twice a week, and keep in mind that these Californians need 11 hours of sunlight a day. A family member of the ladybug, Stethorus punctillum is a very small black beetle. These little friends could be your most valuable ally against dreaded Spider Mites. They find populations by smell, and fly between plants. They handle dry conditions and are ideal if the Spider Mites are getting out of control and you’re having problems regulating greenhouse temperature. They also leave eggs at the scene which will hatch and keep working against the Spider Mites. They are susceptible to insecticides, so they’re best used when you’re not using chemicals. If there are lots of Spider Mites, immediately release 1 Stethorus punctillum for every 10 square feet of greenhouse. You can reduce the ratio by 10 if Spider Mites haven’t become a real problem yet. Preferal can also be used against Spider Mites. It can also help with Broad Mites, Hemp Russet Mites, Eriophyid Mites, Whiteflies, Thrips and Aphids. It’s made from a naturally-occurring fungus, Isaria fumosorosea, which is delivered via blastospores for fast germination. The spores stick to insects, then germinate and penetrate through their skin, continuing to grow inside. This kills the insect and more spores are released to do the same to other insects. Preferal won’t harm the good pests, or at least it’ll do very little damage. If you’ve used Stratiolaelaps scimitus and you then still spot Fungus Gnat larvae in the soil, then get going with more Stratiolaelaps scimitus. Stratiolaelaps scimitus works best against Fungus Gnats before a proper population starts to thrive. Check your traps, and if there are fewer than 10 Fungus Gnats in the week, then you can consider the population low. If you catch the Fungus Gnats in their larval stage or in this early stage of low numbers, you should only have to apply Stratiolaelaps scimitus twice, once when you discover them and a second time two or three weeks later. This should cover your whole crop cycle. The problem with Aphids isn’t really Aphids themselves, who rarely do significant damage to a plant, the problem is their excreta. Aphid excreta has been dubbed “Honeydew” because it attracts ants. Honeydew can also lead to sooty mold, which is also unpleasant for cannabis plants. You don’t have to worry about Aphids while planting or before the first leaves show. Aphids are attracted to soft new plant growth. It’s when this appears that you need to have a look. Aphidoletes aphidimyza is predatory midge, which will happily control your Aphids for you. You don’t need more than 1 for every 100 square feet. If Aphids have been around before, make sure Aphidoletes aphidimyza is also around from the first leaf growth, and then apply every week during the cycle of your crop. But there is a catch. Before letting this predatory midge loose in your greenhouse, you’ll have to get rid of all the ants. The problem with ants and the Aphids’ Honeydew, is that Honeydew is a valuable substance to ants, and they will go to great lengths to ensure they protect the Aphids in order to “farm” them and get their greedy maws on the Honeydew. If ants feel their precious Aphids are under attack, they have been known to relocate their Honeydew producers to safer areas within crops. Aphidius colemani are very small parasitic wasps. They’re about 2 to 3 mm long, dark in color and they don’t sting. They’re natural enemies of the Aphid. These little wasps use the Aphids as hosts for their larvae. When the larvae begin to pupate, the Aphids become rigid, mummified, and that’s it for the Aphids. It’s good to keep Aphidius colemani around if you have Aphids. They home-in on Aphid colonies quickly, finding all those little pests. However, just using Aphidius colemani alone won’t be enough. They’re best deployed along with Aphidoletes aphidimyza and ladybugs. Favret, C. and G.L. Miller. 2012. AphID. Identification Technology Program, CPHST, PPQ, APHIS, USDA; Fort Collins, CO. [date you accessed site]. <http://AphID.AphidNet.org/&gt;. Root Aphids are gall-forming Aphids and they can be tricky to handle. They’re difficult to diagnose, and observe. The best way to deal with them is to prevent them, since once they’re fully established they’re hard to get rid of. Since you almost definitely already using Stratiolaelaps scimitus to prevent or control Spider Mites and Fungus Gnats, you’re in good hands. Stratiolaelaps scimitus feeds on Root Aphids as well as Weevils, but, unfortunately, only on the first and second instar larvae. Which is why it’s best to get them early. When your cannabis plants are first rooted, this is when to apply Stratiolaelaps scimitus. Of course, you’ll have already done this, so you’ll hopefully avoid these pesky Root Aphids altogether. Rove Beetles have an appetite for Root Aphids, but are best deployed in conjunction with Stratiolaelaps scimitus. A single application, or letting loose, of Rove Beetles should do the trick for the entire crop cycle. Just make sure you release them at the beginning as they take longer to establish than mites and nematodes. Thrips are nasty insects. They’re very small and thin. They can fly, but fortunately not very well and not far. Like Spider Mites, they want the chlorophyll from your cannabis plant leaves. They scrape the surface and can cause quite a bit of damage. There are many species of Thrips. The main ones you’re likely to encounter are Greenhouse Thrips, Western Flower Thrips and Onion Thrips. There are also Oxythrips, which are dedicated cannabis feeders. While some growers have reported problems with Oxythrips, they’re quite rare, especially compared to the other species mentioned. Amblyseius cucumeris is a predatory mite which attacks the first and second instar larvae of Thrips. Amblyseius cucumeris is a clever no-nonsense Thrip killer which senses Thrips emerging from the cannabis leaves. It waits patiently for the little Thrip heads to pop out and then unceremoniously, chomps those heads right off. Our old friend Stratiolaelaps scimitus, which should already be in the soil, will make sure that the cycling of Thrips is reduced, possibly by up to 80%. Another old friend, the Rove Beetle, will also eat Thrips while they’re in the soil. Make sure you’ve got 1 Rove Beetle for every 10 square feet of greenhouse. Nemasys can also help with Thrips. The Beneficial Nematodes of Nemasys can help manage many pests. It’s a product mentioned under Fungus Gnats. Have a look. From the get-go you should have a 1 yellow sticky trap for every 500 square feet of greenhouse. Don’t place these traps higher than the plants, or the Thrips will head to the plants rather than the traps. For Thrips, you can increase the allure of the trap ten-fold by adding a few drops of either almond or vanilla essence to a cotton ball and sticking it to the trap. We offer lures which work in the same way. Thrips like beans, which are more attractive targets for them than cannabis. Bush Beans also allow you detect Thrips early on in the game. Grow the beans from seed and place the plants as close to, even touching, the cannabis plant. Thrips might be tempted to hop across. A tub of soapy water might be just the thing to clean your greenhouse of Thrips. Use this to wipe out large numbers of Thrips. Make sure the tub is yellow or white, about 18 by 12 inches, and 6 inches deep. Fill the tub with water and add a little dish washing liquid, stir it up. Again, you can add some vanilla or almond essence. Adult Thrips should be drawn to the tub, its scent. The scent will last about three days. If you see that it’s working, then repeat until the Thrips are all done for. While Spider Mites, Aphids and Gnat Fungus have long been a headache for cannabis growers, Broad Mites, Russet Hemp Mites, and Eriophyid Mites are relatively new to the scene. They are less common, but some growers have had problems with them. They’re also a trio which you’ll only find on indoor crops, and, more concerning, evidence of their pesky selves typically becomes apparent once the plants have matured. Then you’ll see leaves and stems turn bronze and feel greasy. With these three, prevention is better than cure, indeed it’s your only real option if you wish to keep using biological controls. Amblyseius fallacis is your best option for prevention of this trio. Amblyseius fallacis also helps prevent Spider Mites from developing into a problem. As soon as you see the first proper leaves begin to grow, then you’ll want to release Amblyseius fallacis. 2 mites per square foot should do the trick, although you should release at a rate of 4 per square foot if you’ve had trouble with these mites before. The good news is that when you cannabis plants begin to grow their sticky heads, these mites, and others, will begin to move away. Another good preventative mite is Amblyseius cucumeris, but it will deal with this trio in their early stages of development. So get in there early. Amblyseius andersoni mites are to be used once you’ve already spotted adult Russet Hemp Mites. Amblyseius andersoni is most effective when the colonies are small. These predatory mites will eat small colonies and stop them from growing and hopefully prevent serious damage. Californicus (Neoseiulus californicus) The clue’s in their name, these predatory mites are native to California. They will sup on many harmful mites. These predatory mites will happily devour Broad Mites. They like warm weather and will stop functioning if the temperature drops below 59°F. Preferal can also be used against Broad Mites, Hemp Russet Mites and Eriophyid Mites. It can also help with Whitefly, Thrips, Aphids and Spider Mites. It’s made from a naturally-occurring fungus, Isaria fumosorosea, which is delivered via blastospores for fast germination. The spores stick to insects, then germinate and penetrate through their skin, continuing to grow inside. This kills the insect and more spores are released to do the same to other insects. Preferal won’t harm the good pests, or at least it’ll do very little damage. Whitefly is not something you’re likely to have to worry about. Whiteflies don’t really go in for cannabis plants but you can’t be too careful, nasties can take-up anywhere. They’re related to Aphids, and also love that Honeydew excreta which has the two problems of becoming sooty mold and attracting ants who will go out their way to protect their treasured Honeydew. Like Aphids, Whiteflies can cause significant damage to your crop. Have a look at your yellow sticky cards, and if you see Whitefly then speedily release Encarsia formosa, a parasitic wasp. You should have 1 wasp for every 10 square feet of greenhouse. A friendly little bug, family to the ladybug but smaller. Delphastus is a Whitefly predator which prefers to eat from a sizable population, and also likes temperatures between 61°F and 90°F. It will feed on Whiteflies during any stage, but is more effective as a biological control when the Whiteflies are in the egg or nymph stages. It should go without saying that monitoring tools are very sensible. They let you know what kind of pest you’re dealing with. Since you’ve invested time and money, you want to stay on top of any potential problem. Use these to detect Thrips. Place 1 trap for every 500 square feet of greenhouse. Be careful to place the traps lower than the plants, otherwise the Thrips will choose the plants instead of the traps. Strike and Provider varieties of Bush Beans can be really useful, and you’d be doing yourself a favor to keep Bush Beans growing alongside your cannabis plants. And plant them close to, even touching, the cannabis plant. Grow them from seed, or you might bring in pests from the nursery. Some nasties find Bush Beans very attractive and will maybe even migrate across from the cannabis. Then you can wrap of the Bush Bean plant, dispose of it, and grow another in its place. Repeat the process until your crop is fully grown. It’s good to know that this method has been notably successful for growers of Mother Plants. Expect especially good results when it comes to Spider Mites. Other nasties that you’ll be able to manage with Bush Beans are Thrips, Fungus Gnats, Aphids and Whiteflies. An easy method of detecting Fungus Gnats. Fungus Gnat larvae go after the cannabis roots, and that’s a problem. So slice up a potato, leave half-inch slices in the soil for a full day, 24 hours, and then have a look at the slices. If there’s Fungus Gnat larvae in the soil, you’ll see it on the potato slice.